I have never made any secret about how much I love contouring here on my blog. I have been contouring for years now, and I feel that now I have done it for so many years, I cannot stop. When I don’t contour my face, I literally feel like I have a face the size of the moon, just huge and round with no definition. It is a real slippery slope, once you see what contouring can do for you, it is hard to stop. I am pretty sure that it was Wayne Goss on YouTube that first introduced me to contouring and since then I have been hooked. What I love about contouring is that it can completely change your appearance, you can transform into somebody else through contouring and it helps you look like you’ve lost a couple pounds! I feel like this Bobbi Brown Foundation Stick is such a vastly underrated makeup product. I literally don’t see anybody talking about this and I have no idea why. I have been using this as a cream contour for years and I adore how it looks on the skin. I don’t really know what it was that compelled me to try this for contouring with, I think one day I was just loitering around the Bobbi Brown stand and I saw this and noticed how creamy it was, so I picked a couple of them up in different shades to do a full highlight and contouring look using them. I quickly fell in love with this to contour with over my normal foundation shade. To contour with I have this in the shade Chestnut which is just perfect for my skin colouring. I like to go in with this on top of my foundation around the top of my forehead, down my cheekbones and under my jawline and then I blend it out using my damp Beauty Blender or a MAC 130 brush and I find that my makeup looks so stunning and smooth. A huge benefit of this foundation sticks to contour with is that because it is a normal foundation stick, you get a really good amount of product, so it will last you such a long time. As soon as I saw Charlotte Tilbury talking about his on her Instagram, I knew that I had to try it out. If you have followed my blog for some time already, you will know that I love pretty much everything Charlotte Tilbury. I am yet to find a product by her and the brand that I don’t completely love, so I had high hopes for this. I am pretty sure that this went up for sale last August on her website and literally 5 minutes after the launch time I had already checked out with two of them. I bought two because I was already pretty sure that I was going to fall in love with it after seeing all of the press for this in the run up to it being released. From the moment I got this, I was in love with it. The shade that I bought is just perfection for my tanned skin tone. I have a medium/tanned skin, and this is the perfect shade as a contour, which makes me so glad that I bought two of them. This is a super creamy formula that makes my makeup look like perfection. I feel like not only does this contour, but it also adds a certain glow to the skin that makes it look incredibly pretty. Over the past year, I have found myself reaching for this more or less daily. The only thing I wasn’t too sure about when I first received this was the sponge applicator on the end and I know that a lot of people do dislike it, but personally I really love it. It just helps to apply it to your skin super softly, without displacing the foundation underneath. I have made no secret over the years that I am in love with the MAC Full Coverage foundations. I first bought this years ago when I got my professional MAC card, I was so excited to be able to go into store and buy these because back then they were a Pro item only. I bought this in a normal foundation shade as well as a highlighter and a contouring shade. I have been using this for years to cream contour with and I really do think that it is up there with my Bobbi Brown stick foundation on terms of cream contouring which is pretty high praise. I think the reason why I love this product and reach for it is because it is so full coverage. When I contour my cheekbones, no matter what product I use or what tool I use to blend it out, most of the time the foundation underneath does move even if it is ever so slightly. The good thing about this product is that because it is full coverage, even if the foundation is moved underneath, the contour has its own layer of coverage so none of my hyperpigmentation or sun damage is on show. Not to mention that this is a super creamy and blendable product and requires next to no effort to get it to look beautiful. I had to throw this one in there because I am sure if you have followed my blog since the beginning then you will know that I have loved this LA Girl Pro Conceal to contour with for such a long time. When I first saw Carli Bybel using this, I knew I had to try it out. Surely if the queen herself likes something then I will like it too. I bought this along with a highlighting shade and got to work. I started out with the highlighting shade and I have to admit that I really didn’t like it. I found that it broke up and looked choppy on my skin, which is why it took me months to even break the seal on the contouring shade. When I finally started to use it, I was kicking myself that I hadn’t tried it sooner. Even though it must be the same formula as the lighter shade, I think the area where I apply the highlighter, where I get oily around my nose, causes the product to break up. But, in the contouring areas I am quite normal, so I find that this works like a dream. It blends out really nicely and makes my skin look so incredibly smooth. I would say that this is redder toned than a typical contouring shade, but at the end of the day it isn’t really designed to contour with and for the incredibly low price, I don’t even care! When I first got my MAC Pro card, many years ago, I can remember going into the store and pretty much buying every single thing that I could get my hands on. This was one of the items that I picked up. At the time I was doing bridal freelance makeup and I had pretty much every single shade of this powder foundation in my kit. Then, one day I reached for this to contour with and I fell completely in love with it. The way it looked on my skin was just unlike any other contouring product that I had used before and I loved the finish that it gave my skin. From the moment that I started using this powder, the first thing that I noticed was just how easy it was to contour with. I could apply a big block of this to my face and within and instant it is blended out and looking so stunning and flawless on the skin. Because this is a foundation powder, in the pan you get such a huge amount of product. I have been using this exact shade to contour with for going on 5 years now and I have only had to repurchase this once and that is only because I lost my first one! To start with, I really didn’t want to buy this product. I have said it before here on my blog, but when a product has as much hype as this one did, I tend to stay away from it. I don’t know why, it is probably because I just assume that it will not be able to live up to my very high expectations. But, in the end I was scrolling through I think it was Cult Beauty and I just decided to go for it. I had tried out some other things from Kevyn Aucoin before and I really loved how they looked on my skin, so I thought I would really enjoy this. Even though I have the MAC powder which I really love to contour with, I love this for a completely different reason. For me, this is the most perfect contouring powder for somebody with tanned/medium skin like I do. This still has the classic grey undertone which gives the illusion of a shadow being cast, even though I have the deep version. I love reaching for this and I use it when I want to get a really sharp and chiseled look. I go in with this and my Nars Ita brush and it is a match made in heaven! I couldn’t really do a post about contouring products without at least mentioning this contouring and highlighting palette by Charlotte Tilbury. Like I mentioned earlier on in this post, I really do not think that Charlotte Tilbury can do any wrong, in my eyes her products are just perfection and the same goes for this duo palette. When I first bought this, I thought that the contouring shade would be a touch too light for my skin tone, but in actual fact it is the most perfect shade that I have for a contouring product. It is ashy, but not too ashy and it blends into the skin like a dream. I think I mentioned in a post a couple of weeks back, but I am really trying to reduce the amount of makeup that I wear on a daily basis. Since starting a good skincare routine, I am much more confident about my skin and I don’t think twice about leaving the house with next to no makeup on or at least minimal makeup and this has creeped its way into my everyday minimal makeup routine. I use the Charlotte Tilbury Cheek and Sculpt brush and it just applies like a dream and looks so light and natural on the skin. I love using this and I know that I am going to keep one of these in my collection for such a long time. Now onto the last product that I’m going to mention in this post. I put off buying this bronzer for such a long time because I just didn’t think that it was going to work well for me. 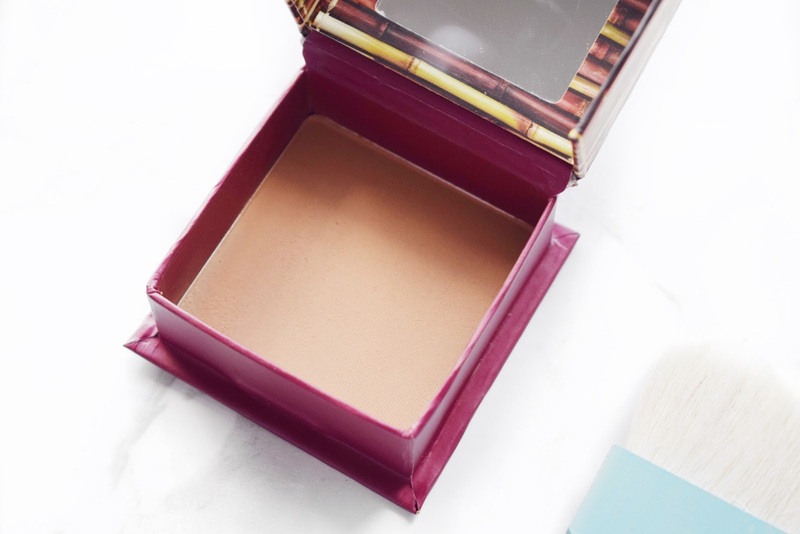 Like I have mentioned before in this post, I have quite tanned skin, so I am limited to what contouring and bronzing products I can use and similarly to the Charlotte Tilbury Filmstar Bronze and Glow Palette, I thought that this was going to be too light for my skin. In the end, I got a Benefit kit for Christmas and it has a Hoola in there, so I thought what was the harm in trying it out. Little did I know that I would fall in love with it. I have raved about this time and time again here on my blog, so I will try and keep this short and sweet. What I love about this powder is just about everything. The shade, the consistency, how it blends and best of all how it makes my skin look. This is just a touch deeper than my skin, which makes it perfect for not only blending, but contouring with. If I want to get a sharp but natural contour, I will just take this on a Nars Ita brush and carve out underneath my cheekbones. It is an incredible product that I find myself reaching for all of the time! So, there you have it, my favourite contouring products. All of these products I really believe in and I think they work incredibly for my skin. I would never recommend you anything that I don’t fully believe in and I love every single item that I have mentioned. As normal, I will leave link down below to everything that I have mentioned in case you want to check them out. Make sure to leave me a comment down below and let me know what contouring products you’ve been loving recently. It is such a lovely product, amazing for the price point! 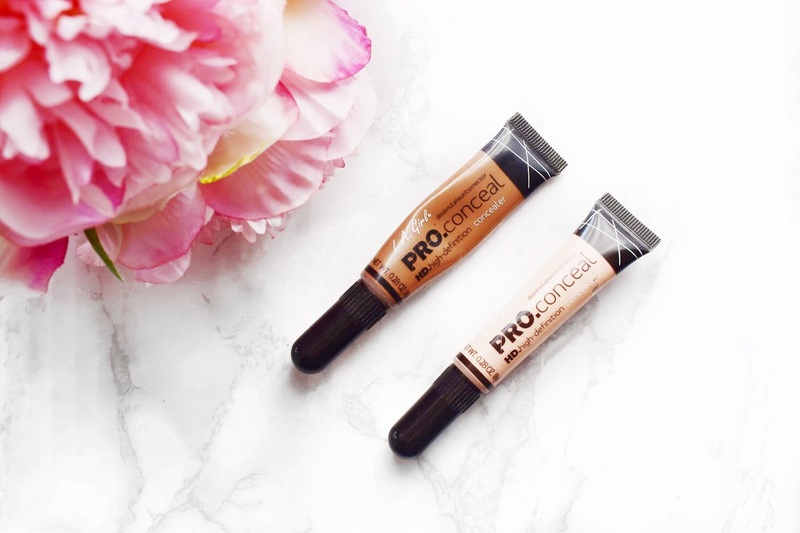 The LA Girl concealers are brilliant! They are absolutely amazing for the price! Charlotte Tilbury is just an amazing reliable brand! I'm the same I have to contour everyday! I've heard really good things about the sculpting power, it looks beautiful! It is such a great product, amazing for a light contour every single day! It is a really great effortless product! These sounds like amazing products! Such great products, I love every single one of them! It is such a light layer of coverage that does a great job at contouring the face! When I first ordered the LA Pro concealer, I ordered a shade that was too dark for me so I use it for contouring and works great. I love their formula and lasts all day! It is such an incredible product, perfect for contouring with! I really want to try the Kevin Aucoin product but I can't find it in store ! It’s online at Space NK, such a great product! I feel like I have fell back in love with contouring all of a sudden! I would say that it is longer lasting, it can feel heavy on the skin though if you do build it up to be a full coverage product! I know, every single time I pick it up, I remember why I loved it so much to start with! Hoola is such an incredible product, it applies so beautifully to the skin! Such an amazing powder, it applies beautifully and is just the right tone!